One most fundamental tools of technical analysis is the moving average. As you will discover, it comes in many different variations, but each is clearly defined and unambiguous, which is part of the secret to producing a reliable trading system. As we noted in the previous section, patterns never turn out exactly like the book shows them and they have to be interpreted – you don’t have this problem with a moving average system. help to show trends. A moving average is simply the average price of an asset re-plotted onto the original chart to strip out the intraday fluctuations and smooth the overall trend line. If you’ve not been involved with trading before, you may know what an average is, but wonder what the “moving” part is about. As most people know, an average is when you add together lots of numbers and divide by the number of numbers, giving you a middling number. So if you had two, three, four, six, and ten, that’s five numbers in total, you would add them together to get 25 and divide by the five to get an average of five. And when you look at the numbers, three of them are less than five and two are greater than five, so that looks about right. The moving average is a simple idea but very powerful – you can base the main part of your trading system on moving averages. There are several different types of moving average, apart from the different moving averages you get when you take a different number of days. What we’ve just looked at and described is more properly called a “simple moving average” (SMA), and the shorthand for it is those initials and the number of time periods or days, so the SMA (10) is a simple moving average using the last 10 days, which is shown above. There are several types of ‘standarised’ moving averages adapted to different timescales including 20- 50-, 100-, 150-, and 200-day moving averages. Taking the case of the 200-day moving average for instance, the prices for this period would be aggregated and then divided by 200 on a rolling basis. However we believe that moving averages should reflect the trading period you wish to identify. 20 day moving average: There are typically 20 business days in a month and so the 20-day reflects the monthly trend. The theory of the moving average is if the price of the asset remains above the moving average line benchmark the overall trend is up, and vice versa if the price action comes beneath the moving average benchmark. On this chart the trend has clear momentum to the upside and so therefore is in an uptrend. Technicians use crossovers (when a shorter term moving average breaks above a longer term moving average) to further strengthen their case to determine whether an asset is going to continue to rise in value. For many people the simple moving average is all they need in their system, but as noted above if you’re trying to predict the future it does have the disadvantage that the information is lagging behind the price. If you think about it, that’s inevitable with any indicator because we don’t know what the price is going to be in the future anyway, we can only base our guesses on what we know. Analysts have tried to improve matters by placing more reliance on the later information, making the most recent numbers have greater significance, which is called “weighting” the data. This has led to a load of different “moving averages”, but for the most part you don’t need to worry about them, as they are just slight refinements and sometimes only useful for particular circumstances. That said, there is one other type of moving average which is used quite a lot, and that is called the “exponential moving average” (EMA). This applies more weight to recent prices, and as you can see from the graph below that means that the EMA(10) moving average, added in green, follows the current price more closely than the simple average. This is particularly important at changes in direction or trend, when you want to get “up to speed” as quickly as possible. Now you know the basics of moving averages, and you would be surprised how many ways have been invented to use them to try and predict where the price is going. By the way, one more thing to mention before we look at some of those different ways is that you may get involved in discussions with other traders about which price to use for calculating a moving average. You see, the usual way to calculate a moving average is by using the closing prices of each day, but some traders get upset and argue that you need to look at prices throughout the day. Some even plot two moving averages, one of the daily highs and one of the daily lows, and this gives an indication of how volatile the price has been. As these ways of plotting the moving average are not generally used in charting programs, we won’t bother about them. There are many types of moving averages and traders typically use more than one to determine market momentum. 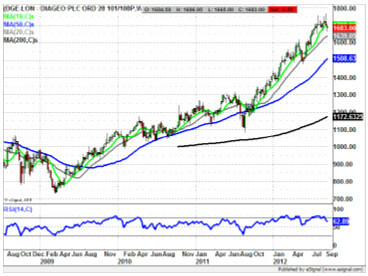 The most popular are the Simple Moving Average (SMA) or the Exponential Moving Average (EMA). Note: Moving averages especially on higher timeframes are of huge importance, I’m not so much worried about moving average crossovers but I do like to see moving averages sloping in the way of my trade, obviously this won’t happen over every timeframe and once in a while you will be taking trades where 1 timeframe conflicts with another. But in general on larger timeframes (say, daily) I’ll pay respect to what the moving averages are telling me and where they are positioned for support and resistance. But I will trade against these on lower timeframes especially say taking shorts if those larger timeframes have shown a negative candle or vice versa with a bullish candle. One little tip for the 200 moving average; I just find that although moving averages act as support and resistance an approaching candle will usually pierce that line by a few pips before retracing in my experience a 200 tma tends to avoid that more often than not.